Stop grinning Smith junior! Don't you realise this is a DISASTER boy? Seven classrooms, five science labs, three staff rooms and a gymnasium destroyed - cease giggling at once, Isabel! 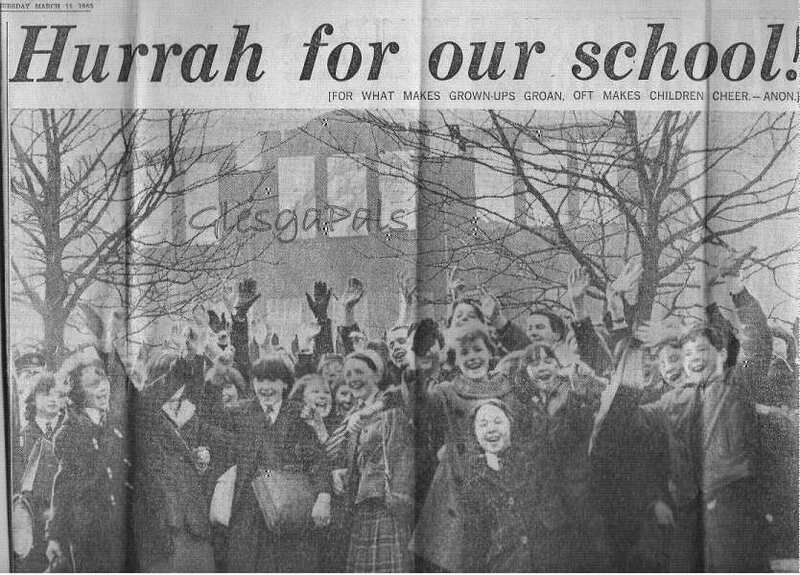 But events that make grown-ups grown, often make children cheer like the pupils of John Street Secondary School in Bridgeton, Glasgow, yesterday ....... the day after their school burned down. Hundreds of happy children showed their delight yesterday as firemen raked through the smouldering ruins of their school. The blaze began at 5 a.m. yesterday morning. One hundred firemen using turntable ladders and hoses, fought the fire which swept through the top storey of the main building. Later a senior CID officer said that the school had been raided during the night. And he stated: "At this stage it seems as though the fire was started deliberately. Some articles have been removed for examination." Twelve firemen fled to safety when the roof of the building - built in 1900 collapsed in a shower of sparks. They raced down two floors as blazing timber and masonry caved in. When the school's 511 pupils arrived in the morning, they were given milk and lined up in the playground, as headmaster Mr.Charles Moore told them: "It is with regret that I must send you home" The children cheered but Mr.Moore added: "I don't want excitement to turn into disorder." Education officials were later trying to organise alternative accommodation for the children.
" I lived at 12 Greenlodge terrace, Bridgeton. I attended John St.Primary. Then John St.Secondary (the old building before it was burned down). I actually watched the school burn from my living room window, the chemistry labs going up in multi coloured flames. My dad woke me and I jumped from my top bunk bed (the bunks were in the bed recess) to see the fire in all its glory! After the fire I travelled every morning on the school bus to Craigie St. and returned to the new building when it was built. I think my year was the only one to attend all three schools. A wonderful website, both my Mum and Dad can't wait to see it, keep up the good work." 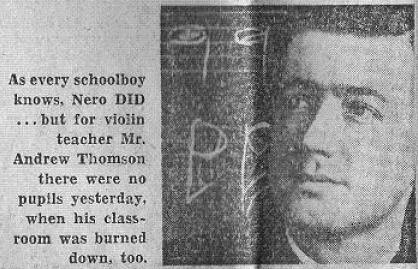 Hi Webmaister I have a newspaper clipping from 1965 when one of the buildings in John St School burned down. It shows quite a few of the pupils enjoying themselves at the horrendous news...(one of them, me).